LIGHTING AND SPACE HEATING ACCOUNT FOR 76% OF TOTAL ENERGY USE IN NON-REFRIGERATED WAREHOUSES. High Bay Industrial LED Lighting fixtures reduce energy costs by 30 to 50%. 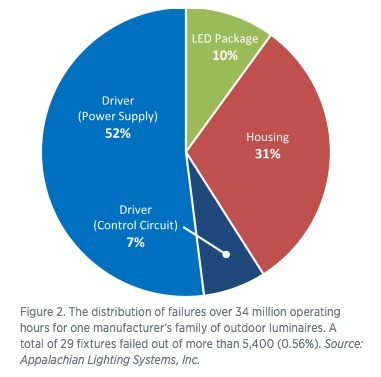 Lighting typically makes the largest contribution to the peak demand in a non refrigerated warehouse (A). Refrigeration is commonly the primary driver of peak demand in refrigerated warehouses (B). Regardless of warehouse type, though, converting to LED lighting and using energy-efficient measures reduces consumption and lowers monthly energy costs. A statistical measure (or estimate) of how long a product is expected to perform its intended functions under a specific set of environmental, electrical and mechanical conditions. Lifetime specifications can only describe the behavior of a population; any single product may fail before or after the rated lifetime. A statistical measure (or estimate) of the ability of a product to perform its intended functions under a specific set of environmental, electrical, and mechanical conditions, for a specific period of time. Reliability estimates for the entire useful life phase of a product are commonly reported using MTBF (Mean Time Between Failures) or MTTF (Mean Time To Failure). Looking for more ways to cut your energy bill? Let CDL help with energy recommendations tailored to your business and your budget. Complete this form to request a free on-site consultation. A CDL Lighting Specialist will contact you to arrange an appointment that fits your schedule. It’s free, convenient for you, and you’ll save money!